If your garage doors make an R2D2-like, squeaky sound when you roll them up, you probably feel annoyed all the time. But the problem is – you probably don’t even know what the issue is in the first place. Well my friend, in this case, you need to replace the rollers on your garage doors. A roller is a major component of your garage door. In fact, your door won’t be going anywhere if the rollers stop working. And all of that squeaking means that your rollers are in a pretty bad shape. So the next logical questions – how can you replace your rollers? One option is to visit Price Experts and look up repairmen in your area. However, if you don’t feel like spending too much money on minor repairs, you can actually replace the rollers on your own. 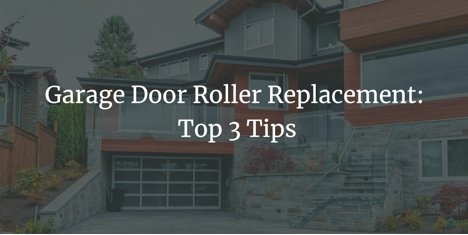 In order to help you with this problem, here are a few tips for garage door roller replacement. Set up a ladder on the side of your garage door. Just make sure that the length of your ladder is sufficient. Use a wrench to remove the nuts that are keeping the old rollers in place. Tap out the bolt and pull an A-shaped roller sleeve out, along with the old roller. Take out the new roller, and insert it slowly into the door track. Carefully align the mounting holes on the hinge of your doors. We say carefully because the alignment needs to be just right for screws to go through them. When everything’s in place, you just need to screw everything in place. If you have a steel door, you should use one of those self-drilling screws to make things easier. But if you have wooden doors, you’ll need some help. Ask someone to go on the other side of the garage door. Then, they should tap in the through bolts, while you’re holding the hinge in place. After you’re done, take an ordinary wrench and secure the nuts on the bolts. There you have it – by following the three simple steps, you can easily replace the rollers on your garage doors. If you still aren’t quite sure what to do, you can also look up a few videos on YouTube to help you with the whole ordeal. And if you’re still not confident enough to try your hand at it, you should simply contact a professional near you to do the dirty work. But with a little concentration, basically anyone can replace their garage door rollers, so I wouldn’t worry too much if I were you.